Shadow is a 3-year-old black Lab mix who weighs 50 pounds. She is at Lollypop Farm for the second time through no fault of her own. This bundle of energy is seeking an active family who will exercise both her mind and body! 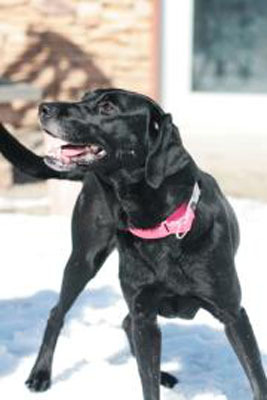 Shadow would do best in a home with children over the age of six, because she tends to get excited when she plays. She would also be happiest as the only dog in the household. Shadow will need to be enrolled in training classes with her new owner – and you’ll get a discount on your first six-week class at Lollypop Farm. This sweet girl has been waiting too long to find her forever home, and can become a part of your family for a special adoption fee of $75. Yogi, the cat from last week was adopted!